Two Entangled Dry White Twigs. Well that's some title. Took me a long time to think that. Why? because 'Simplicity is obvious, but because there is so much clutter around us, we fail to spot it". This is Macro Minimalism / Macro Photography and of course the theme here is "Nature". I generally don't shoot such subjects, but since I have my New Canon 100mm Macro Lens with me now, I am exploring Macro Nature as a Minimalism Subject. To be frank, I am enjoying it. OK, so lets get to the Composition Highlights now. b) The Smooth Creamy Bokeh Background. I actually found this at Smriti Van (forest) in Jaipur. I was there for an Instagram Meet. This Twig pair was spotted at the Centerpiece Decoration of the Yoga Garden at Smriti Van, which had a lot of creeper plants on it. I was having a discussion with my friend and was telling him how eager I was to spot and shoot a Spider Web. I initially spotted a few Strands of the Spiders Web but I wasn't happy with that. When I looked around the entire Centerpiece Decoration, I actually failed to spot any worthwhile Spider Webs. 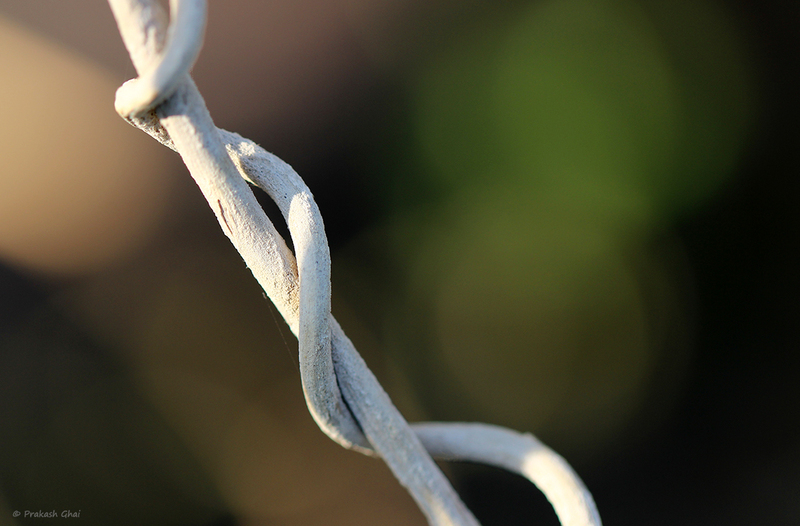 With a sad, dull mood, I decided to make these Two Entangled Dry White Twigs as my stop-gap subject. I clicked this very casually and took just 2 shots. Later, I discarded one of it, but kept this one. I did one mistake here, which I later corrected in post processing/editing. It is very difficult to get sharp focus in handheld Macro Shots. And my Camera provides only 1 Cross-Point Focus option. That is the Center Focus Point, out of the 9 in total available in the view-finder to focus. So, to get this sharp, I used that center focus point and clicked this image. But, I ended up center-placing my subject and that was looking awful, just awful. I did not use the other focus points as they would not have given me this clear and sharp picture. Also, I did not Compose-Recompose by physically moving the camera after locking focus, to get the rule of thirds right, because in Macro Lenses, you tend to lose focus with the slightest of movement. OK, that a long chatter. Hope you liked my effort. Stay tuned for more.